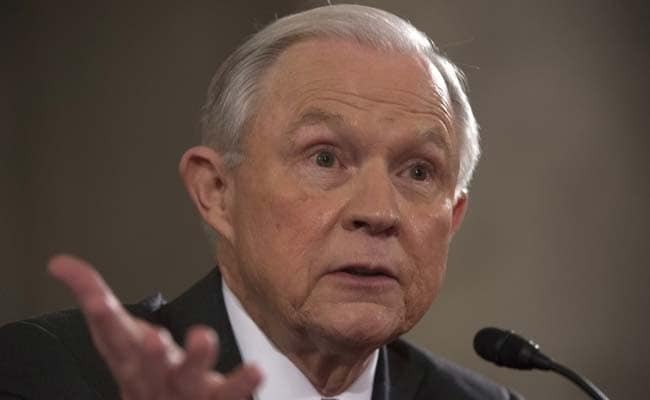 Washington: US Attorney General Jeff Sessions withdrew on Thursday from any probe into alleged Russian meddling in the 2016 presidential election after it emerged he had contacts with Russian officials while involved with President Donald Trump's campaign. But Sessions, a long-time US senator before becoming the country's top law enforcement official, said he did nothing wrong by not disclosing during Senate testimony that he had met last year with Russia's ambassador. He said the meetings were in his capacity as senator, not as a campaign aide. "I have recused myself in the matters that deal with the Trump campaign," Sessions told reporters at a hastily arranged news conference, after several fellow Republicans in Congress had called for the move. But his announcement did nothing to quell Democratic concerns, with House Democratic leader Nancy Pelosi repeating a call for him to resign and saying "his narrow recusal and sorry attempt to explain away his perjury" were totally inadequate. Sessions said he had been weighing recusal - ruling himself out from any role in the investigations - even before the latest twist of the controversy over ties between Trump associates and Russia that has dogged the early days of his presidency. The move means Sessions, a powerful member of Trump's inner circle, will not be briefed on details of any probe. Should the Federal Bureau of Investigation decide to move forward with charges, Sessions would not be in a position to weigh in on whether the Department of Justice should take the case. The controversy comes as Trump and Republicans who control Congress are trying to move past early administration missteps and focus on issues important to them, including immigration, tax cuts and repealing the Obamacare healthcare law. US intelligence agencies concluded last year that Russia hacked and leaked Democratic emails during the election campaign as part of an effort to tilt the vote in Trump's favour. The Kremlin has denied the allegations. Trump fired national security adviser Michael Flynn last month after revelations that Flynn had discussed US sanctions on Russia with Russian Ambassador Sergei Kislyak before Trump took office and that Flynn had misled Vice President Mike Pence about the conversations. During his Senate confirmation hearing in January, Sessions responded to a question from Democratic Senator Al Franken that he did not "have communications with the Russians" during the presidential campaign. But on Wednesday night, the Washington Post revealed that Sessions, who was a senior campaign aide of Trump's, received Kislyak in his Senate office in September. The other encounter was in July at a Heritage Foundation event that was attended by about 50 ambassadors, during the Republican National Convention, the Post said. Sessions said he was "honest and correct" in his answer to Franken, drawing a distinction between his role as a senator and his role as a campaign aide. "I never had meetings with Russian operatives or Russian intermediaries about the Trump campaign," Sessions said, but added that he felt that he should not be involved in investigating a campaign in which he had a role. At least two other officials in Trump's campaign said they also spoke with the Russian ambassador at a conference on the sidelines of the July convention last July, USA Today reported on Thursday. While there is nothing legally wrong with such meetings, the reported contacts raise questions about the White House's repeated statements that it knew of no further contacts with Russian officials beyond those by Flynn. Before the news conference, Trump stood by his attorney general, saying he had "total" confidence in Sessions. Asked whether Sessions should step aside from the investigations, Trump told reporters, "I don't think so." Senate Democratic leader Chuck Schumer, who earlier said it would be like "Alice in Wonderland" if the administration were to approve Sessions' investigating himself, said he should have recused himself the moment he was sworn in rather than waiting until he was caught misleading Congress. Democrats on the House Judiciary Committee asked the FBI to launch a criminal investigation into Sessions' statements to Congress about his communication with Russian officials. Schumer and Dianne Feinstein, the top Democrat on the Senate Judiciary Committee, called for the appointment of a special prosecutor. Sessions is one of many "subjects" of a wide-ranging government investigation of any contacts between the Trump's campaign and associates and Russia, two U.S. officials familiar with the investigation said. The officials, speaking on condition of anonymity, said Sessions was not now a "target" of the probe by the FBI, the Treasury Department, the CIA and the National Security Agency. The investigation, one of the officials said, has a number of subjects because of the numerous contacts between associates of Trump, including Flynn, and the Russian Embassy in Washington as well as Russian and some Ukrainian businessmen and companies. Trump has accused officials in former Democratic President Barack Obama's administration of trying to discredit him with questions about Russia contacts. The White House dismissed the revelation of the Sessions meetings as a partisan attack, saying his contacts with the ambassador had been as a member of the Armed Services Committee.